The current interest in Art Deco jewelry only dates from the late 1970’s. There was a time when Art Deco jewelry was actually worth less than the stones it was made off, thus leading to many pieces being taken apart to sell or use the stones separately. There are several reasons why this situation has changed so dramatically, and is expected to stay that way. Timeless: devotees vary from the Duchess of Windsor to Sarah Jessica Parker. “It goes with everything, and it’s still absolutely chic.” Says David Bennett, the head of Sotheby’s jewelry department for Europe and the Middle East. Limited Availability: where designers sell thousands of jewelry pieces per year nowadays it used to be a few dozen in the 1920’s. Art Deco jewelry prices can hit $100,000 plus, but the starter collector can get in for $1,500. Truly exceptional pieces-made with precious stones and crafted by top designers-can go for much higher. Besides quality of craftsmanship and the strength of the design other key factors in establishing value are a dog’s head stamped inside a piece, employed by French designers only, and for all, the visibility of scant metal on the underside of bracelets, necklaces and earrings. The less metal used, the more skillful the artisan, and the more valuable the piece. 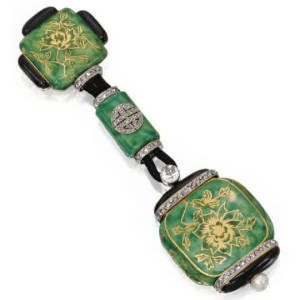 Pieces made with jade are especially valuable today too, due to interest from Asian collectors. Women celebrated their postwar success by piling on the jewelry. Evening fashion of fluid, low belted, sleeveless tunics, was perfect for showcasing multiple Art Deco bracelets. Platinum and diamonds were again in vogue but the Art Deco jewelry style was more geometric and linear than the earlier Edwardian “belle époque” jewels. Jewelry sales in the 1920’s were stellar. This reflected not only the affluence of the general public but the trend for unbridled consumerism. Endless variations of Art Deco bracelets were designed and referred to as plaque, flexible link, box, strap, band or straight-line. The straight-line bracelet often featured the new square cut diamonds developed in Paris, aptly termed “French-cut” diamonds. Art Deco bracelets were frequently accented with natural and synthetic rubies and sapphires. 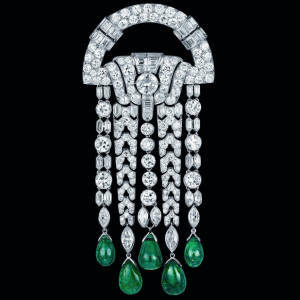 The “emerald” accents often seen in Art Deco jewels were, more often than not, actually green glass. Some examples of natural emerald accents are seen, but they are rare. Raymond Templar Bracelet/clip 1935. It is a Great Example of Convertible Pieces That Became so in Vogue at the Time. The Design is Geometric Representing an Era Where Progress in Tehcnology and Machinery Was a Sign of Modernity. Women celebrated their postwar success by piling on the jewelry. Evening fashion of fluid, low belted, sleeveless tunics, was perfect for showcasing multiple Art Deco bracelets. Platinum and diamonds were again in vogue but the Art Deco jewelry style was more geometric and linear than the earlier Edwardian “belle époque” jewels. Jewelry sales in the 1920’s were stellar. This reflected not only the affluence of the general public but the trend for unbridled consumerism. Endless variations of Art Deco bracelets were designed and referred to as plaque, flexible link, box, strap, band or straight-line. The straight-line bracelet often featured the new square cut diamonds developed in Paris, aptly termed “French-cut” diamonds. 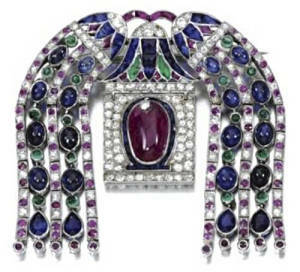 Art Deco bracelets were frequently accented with natural and synthetic rubies and sapphires. The “emerald” accents often seen in Art Deco jewels were, more often than not, actually green glass. Some examples of natural emerald accents are seen, but they are rare. The first designers to contribute to the creation of art deco were French fashion designer Paul Poiret and French jewelry and glass designer René Lalique. Echoing the experimental glass of American designer Louis Comfort Tiffany, Lalique’s glass designs of the 1910s featured continuous, flowing lines and subtle, unusual colours. The colorful and original designs created by artists Henri Matisse and Pablo Picasso for the Ballets Russes dance company in Paris were an additional influence on the emerging art deco style. Art deco designers also admired and borrowed from ancient art that was being unearthed by archaeologists at the time, especially the treasures of the ancient Egyptian king Tutankhamun (exhibited in Paris in 1922) and Maya and other Mesoamerican art. well suited to the Jazz Age, to the increasingly strong image of the liberated and androgynous woman. Després’ modernist, industrial derived pieces are some of the most desirable for collectors of vintage jewelry today. Art Deco Jewelry motifs are characterized by geometric designs, diverse combinations of color and abstract patterns. In 1922, the opening of Tutankhamen’s Tomb in Egypt inspired another Egyptian revival. Influences from cubism as well as African, Oriental, Persian/Islamic, Jugendstil and Native American designs were common in Art Deco Jewelry. 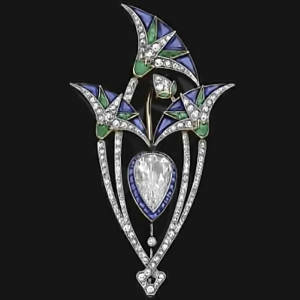 Art Deco style in other European countries was largely derivative, like the Italian G. Ravasco’s diamond studied geometric creations or Theodor Fahmer’s later jewels. Some London jewellers, like Asprey and Mappin & Webb, produced Art Deco Style confections, but these are largely unsigned so the designers are unknown. 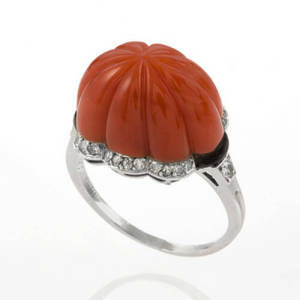 Some British design jewellers however, like Sybil Dunlop, Harold Stabler and H.G. Murphy, known primarily for their Arts and Crafts pieces produced decidedly modern jewels. 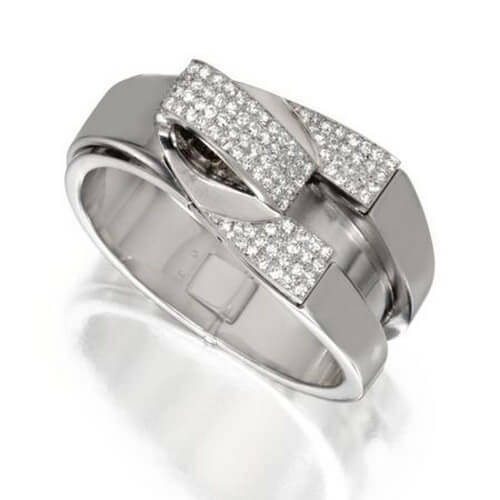 Geoge Jensen’s firm in Copenhagen continued to produce silver jewelry in the Art Deco era adding sharp geometric forms to it’s repertoire of stylised motifs, these in turn were imitated by a host of European jewellers. The indigenous Mexican silver industry was highlighted in the Art Deco period by the talents of an American architect designer teacher, William Spratling, who settled in Taxco in 1929. He opened a shop dealing in traditional crafts and also started a school where he trained natives to work with silver and other substances. A whole community sprang up in Taxco around Spratling and his wife. Several significant jewelry manufacturers like New York’s Oscar Heyman & Brothers, the Bonner Manufacturing Company and Walter P. McTeigue, Inc, provided Saks Fifth Avenue and other exclusive department stores with their creations. Even the mail order Sears, Roebuck catalogue featured moderne jewellery. The motifs of Art Deco Jewellery range from the sublime to the ridiculous: from stunning geometric configurations of paste to silly cherries dangling from a wooden bar. The former has borrowed its subject from deluxe jewellery of the time, but the latter, a joke, has come about more or less on its own. Animals and people inhabit the world of 1920s and 30s costume jewelry, from gentle playful fawns and playful plastic Scotty dogs to paste, turquoise and Marchasite Chinamen and elegant, gilt metal cloche hatted vamps. Flowers in every possible colour, combinations and variety sprouted on gilt metal or silver brooches and pendants, their paste petals glittering shamelessly.